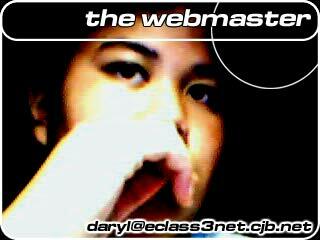 Welcome to eclass3net.tripod.com! Use the navigation bar to the left to explore eclass3net. Eclass3net is dedicated to my mom, dad, my two lovely sisters, Mr. Zisman (my technology instructor,) Div.3 of Chief Maquinna Elementary School and to the students of the Sunrise area. Eclass3net took me several days of non-stop work to finish. To finish off, the applications I used creating this site are: CuteHTML, CuteMAP and Adobe PhotoShop 5.5. Making this site was... hard... I guess. I started on Feburary 23, 2001 and finished on March 5, 2001. I had some experience from previous websites that I made. Anyway, this whole site was made FROM SCRATCH. I DID NOT use any HTML editors other than CuteHTML and CuteMAP, which are very small HTML applications somewhat like Notepad. I just taught myself. Endless hours in front of my computer typing out HTML. I did this for myself, for students and for BCSSA. Mr. Zisman, mellowfemme, TheGoodAngel, Mom, Dad, Mr. McInnes, all my friends (especially wedgeFry) and relatives and YOU... for viewing eclass3net. Well, I guess the above wasn't the last paragraph. Anyway, YOU can help me by correcting any spelling/grammar/information that might be in eclass3net. You can report this through e-mail.